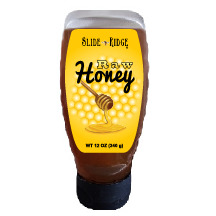 Our Slide Ridge high-mountain Honey is all-natural, raw, and unfiltered. There are no additives, artificial colors, or preservatives, giving you all the health benefits of this natural "super food." At Slide Ridge, honey production is all about the bees! Our bees fly in the pristine, high-mountain valleys of Northern Utah, and feed on a rich and varied diet of mountain wildflowers. The result is a golden, sweet flow of one of nature’s purest foods, honey - a taste of summer sunshine - fresh from the bee to the bottle. This clear, sweet mountain nectar is at the core of all our Slide Ridge products.